In the United States, as in many other parts of the world, the prevalence of overweight/obesity is at epidemic proportions in the adult population and even higher among Veterans. To address the high prevalence of overweight/obesity among Veterans, the MOVE!® weight management program was disseminated nationally to Veteran Affairs (VA) medical centers. The objective of this paper is two-fold: to describe factors that explain the wide variation in implementation of MOVE! ; and to illustrate, step-by-step, how to apply a theory-based framework using qualitative data. Five VA facilities were selected to maximize variation in implementation effectiveness and geographic location. Twenty-four key stakeholders were interviewed about their experiences in implementing MOVE!. The Consolidated Framework for Implementation Research (CFIR) was used to guide collection and analysis of qualitative data. Constructs that most strongly influence implementation effectiveness were identified through a cross-case comparison of ratings. Of the 31 CFIR constructs assessed, ten constructs strongly distinguished between facilities with low versus high program implementation effectiveness. The majority (six) were related to the inner setting: networks and communications; tension for change; relative priority; goals and feedback; learning climate; and leadership engagement. One construct each, from intervention characteristics (relative advantage) and outer setting (patient needs and resources), plus two from process (executing and reflecting) also strongly distinguished between high and low implementation. Two additional constructs weakly distinguished, 16 were mixed, three constructs had insufficient data to assess, and one was not applicable. Detailed descriptions of how each distinguishing construct manifested in study facilities and a table of recommendations is provided. This paper presents an approach for using the CFIR to code and rate qualitative data in a way that will facilitate comparisons across studies. An online Wiki resource (http://www.wiki.cfirwiki.net) is available, in addition to the information presented here, that contains much of the published information about the CFIR and its constructs and sub-constructs. We hope that the described approach and open access to the CFIR will generate wide use and encourage dialogue and continued refinement of both the framework and approaches for applying it. In the United States, as in many other parts of the world , the prevalence of overweight/obesity is at epidemic proportions in the adult population  and even higher among Veterans . Nearly three-fourths of the 5.7 million Veterans  who receive their medical care from the Veterans Health Administration (VHA) are overweight or obese . Overweight and obesity are associated with substantial morbidity and mortality [5–8] and increased healthcare costs for patients, healthcare systems, and payers [7, 9, 10]. In 2001, VHA primary care providers cited effective weight management programs as the most pressing need in preventive services for Veterans . Veteran Affairs (VA) National Center for Health Promotion and Disease Prevention (NCP) designed MOVE! as a patient-centered, multi-tiered set of tools and treatment options based on published guidelines for obesity management [11–14]. A comprehensive set of implementation guides was developed by NCP for local facilities (http://www.move.va.gov). Dissemination of the MOVE! weight management program in a network of 155 medical centers and 872 community-based outpatient clinics made this the largest and most comprehensive dissemination of a weight management program in the U.S. [11, 15]. In the first year of the program, only about 8 per 1000 Veterans who were candidates for MOVE! (body mass index more than 30 kg/m2, or between 25 to 30 kg/m2 with one or more obesity-related chronic health conditions, e.g., hyperlipidemia ) actually participated in the program. In the second year of the program, local facilities varied widely in the number of candidate Veterans who participated in MOVE!, from no participants at many facilities to a high of 37 participants per 1,000 MOVE! candidates . MOVE! cannot help Veterans if it is not implemented as designed. The present study was conducted 18 to 22 months after initial dissemination of MOVE!, with the first aim of applying the Consolidated Framework for Implementation Research (CFIR)  to identify contextual influences that explain the wide variation in implementation success experienced by VA medical facilities. Though the program has progressed significantly since that time, our findings are nonetheless helpful for other large-scale program disseminations. Our second aim is to illustrate, step-by-step, how to apply the CFIR to identify influential contextual constructs on implementation and to suggest refinements to the framework, related methods, and directions for future research. Our approach to evaluating implementation of the MOVE! program in VA is rooted in realist philosophy . The basic tenet of this approach indicates that the MOVE! program will alter context within and surrounding each medical center (e.g., trigger formation of a new interdisciplinary team), which will trigger mechanisms that will result in intended and unintended outcomes. We seek to unpack and understand the complex and dynamic influences at play. Use of theory-based and pre-specified constructs will help to generalize findings and make them more easy to integrate with findings from other studies to build a stronger evidence base to: identify factors that influence or predict implementation success; guide how to adapt programs and tailor implementation strategies; and provide a foundation for developing higher-order models and theories related to implementation . Our approach to use of theory in this study can be described as theory-building, rather than applying a pre-constructed theory or model wholesale. We rely on a ‘menu of constructs’ approach which enables systematic and comprehensive exploration and identification of potential explanatory themes or variables to shed light on the complex social phenomenon of implementation . Taking a menu-of-constructs approach also allows us to flexibly include only constructs that apply to the study at hand, which in turn allows us to limit the duration of our interviews to a reasonable time period. The CFIR provides a comprehensive taxonomy of operationally defined constructs from multiple disciplinary domains (e.g., psychology, sociology, organizational change) that are likely to influence implementation of complex programs . CFIR constructs are organized into five major domains and, as applied to this study, are: characteristics of the MOVE! program (e.g., evidence strength and quality, complexity); the outer setting (e.g., patient needs and resources); inner setting (e.g., compatibility of MOVE! with existing programs, leadership engagement); and the process used to implement the program (e.g., quality and extent of planning, engagement of key stakeholders). The fifth domain, characteristics of individuals involved (e.g., knowledge and attitudes), was not applied in this study because our focus was not on individual-level behavior change. Our evaluation of MOVE! implementation was done retrospectively; qualitative data were collected through semi-structured interviews of key local stakeholders over the telephone. 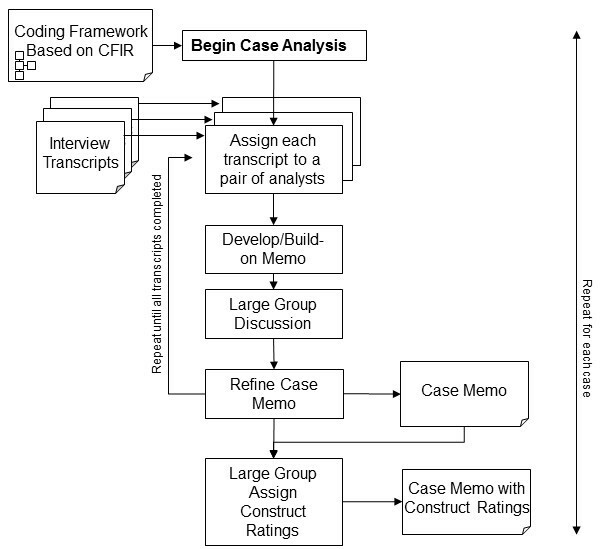 The CFIR was used to guide development of the interview guide and data coding and analysis. We selected sites based on a two-step process. First, administrative data indicating the level of participation of candidate Veterans in the MOVE! program at each VA medical center in FY2007 was used to identify sites in the highest and lowest quartiles of participation. We purposively selected three sites within the highest quartile and two from the lowest quartile in a way that maximized variation by geographic location. Next, information about program components actually implemented and participation rates in the following year were used to characterize implementation effectiveness as high, low, or in transition. Two of the study facilities were characterized as having high implementation effectiveness. Both facilities were in the top quartile for both FYs and had robust MOVE! programs . Two facilities were characterized as low implementation facilities. Though one of these facilities was in the top quartile in FY2007, it turned out ‘participation’ was limited to initial assessment. Veterans were then referred to a community-based program with no follow-up. Our fifth study site had almost no participants in FY2007, reflecting a failed implementation attempt in this first year; however, by the time of our interviews, they were in the midst of renewed implementation activities. The burgeoning success of their second attempt is reflected by increased participation reported in FY2008. A list of facilities and their key characteristics is provided in Table 1. Interviews were conducted between July and October 2007. Thirty-two potential staff were invited to participate in the study; 75% (n = 24) agreed to participate. The regional and local facility MOVE! coordinators were identified from a centrally available list and were interviewed first. We used a snowball sampling technique by asking the local facility coordinators to identify staff who were involved with delivering or implementing MOVE! at their facility . A waiver of signed informed consent was granted by the VA Ann Arbor Healthcare System Institutional Review Board (2007-050289) in compliance with Helsinki Declaration standards. Participants were verbally consented at the start of the telephone interview; permission to record the interview was also requested. Participants were offered a $10 gift card as a token of appreciation for their time. The qualitative portion of the semi-structured interview guide is provided in Additional file 1. After a short series of closed-ended questions (described elsewhere; ), we asked open-ended questions, eliciting descriptions of each respondent’s role and how MOVE! was implemented at their facility. We probed aspects of their narratives to understand how each CFIR construct manifested at their facility. Our research question was focused on understanding context. We focused our questions and analysis on collective perceptions of the program, inner and outer setting, and aspects of the process of implementation. Thus, we did not analyze the data for individual characteristics that are related to individual behavior change. We encouraged open narrations to elicit information the interviewee deemed important and to minimize recall bias . The principal investigator (LJD) led all the interviews. At least one other team member also participated to help ensure all topics were covered and responses were fully understood. All interviews were digitally recorded and transcribed verbatim. Figure 1 shows a schematic of the coding and analysis process. We used a content analysis  and largely deductive approach, using the CFIR as a coding framework . Additional guidance for coding each construct is available online (http://www.wiki.cfirwiki.net). We were also open to new themes that may have arisen inductively from the data. Our coding process was guided by consensual qualitative research methods [24, 25]. The consensual research approach has the following features: data were collected through open-ended questions in semi-structured interviews; multiple judges were used throughout data analysis to foster multiple perspectives; consensual validation was achieved through a process of deliberation and consensus ; and an outside auditor (a qualitative expert not integrally involved in the study) reviewed the process to help maximize validity of findings. More detail about this approach is described elsewhere . Team-based work flow for case analyses. A summary memo was developed for each facility (case) using a two-level deliberated consensus approach. First, a pair of analysts independently coded an individual transcript. They then met together and compared their coding, discussed differences, and agreed on final codes. Based on these codes, they wrote a case memo, organized by CFIR construct; each construct had summary statements with supporting quotes (an example memo with excerpts and a template are available online (http://wiki.cfirwiki.net/index.php?title=General:CFIR_in_action). Pairs of analysts continued to code all of the transcripts for a single case using this process, adding to and refining the memo until all transcripts were coded and the case memo was complete. During this process, each new transcript was used to confirm previously written summary statements, document counterpoints, or add new information for each construct. The entire study team (two pairs of analysts, the two authors, and, periodically, our qualitative expert) met weekly to review the case memos as they evolved. Each pair of analysts presented their contributions to the memo and the larger team reviewed, deliberated, and modified the memo as appropriate. Thus, each case memo was developed through an evolving two-level consensus process. This process resulted in five memos, one for each study facility. The five case memos were each subjected to a rating process. The large group team used a deliberated consensus process to assign a rating to each construct within each facility. Table 2 lists the criteria used to guide assignments of the ratings. The ratings reflect the valence (positive or negative influence) and the magnitude or strength of each construct in each facility based on the case memos. When all constructs for all cases were rated (using a case-oriented approach, because ratings were applied within each case), we compared ratings for each construct across cases (using a variable-oriented approach, because each construct is compared across cases) to help ensure consistent application of ratings. This approach combines the strengths of a case-oriented method, which allows for rich context-specific consideration when rating each construct, with a variable-oriented method, which promotes identifying patterns and relationships by construct across cases to heighten overall validity of ratings . The construct is a negative influence in the organization, an impeding influence in work processes, and/or an impeding influence in implementation efforts. The majority of interviewees (at least two) describe explicit examples of how the key or all aspects (or the absence) of a construct manifests itself in a negative way. • Judged as weakly negative by the absence of the construct. • There are positive and negative influences at different levels in the organization that balance each other out; and/or different aspects of the construct have positive influence while others have negative influence and overall, the effect is neutral. • There is sufficient information to make an indirect inference about the generally positive influence. The construct is a positive influence in the organization, a facilitating influence in work processes, and/or a facilitating influence in implementation efforts. The majority of interviewees (at least two) describe explicit examples of how the key or all aspects of a construct manifests itself in a positive way. Missing Interviewee(s) were not asked about the presence or influence of the construct; or if asked about a construct, their responses did not correspond to the intended construct and were instead coded to another construct. Interviewee(s) lack of knowledge about a construct does not necessarily indicate missing data and may instead indicate the absence of the construct. A matrix was created that listed the ratings for each CFIR construct for each of the facilities. We focused this part of our analysis on discerning patterns across the two high and the two low implementation facilities. We aligned the two facilities with low implementation effectiveness together to compare and contrast them to the two facilities with high implementation effectiveness. This allowed us to identify patterns in ratings of the CFIR constructs that distinguished between high and low implementation effectiveness—i.e., that were qualitatively correlated with implementation effectiveness. Constructs were characterized as: missing too much data to discern a pattern, not distinguishing between low and high implementation facilities, or weakly or strongly distinguishing low versus high implementation facilities. Summary Statement: Stakeholders saw the benefits of MOVE! as a means to extend weight loss programming beyond the preexisting weight management class. Moreover, stakeholders knew bariatric surgery was going to be implemented in the VISN and MOVE! helped achieve the pre-surgery behavioral requirements for surgical candidates. Perception of benefits is also demonstrated by early (early-adopter) implementation status of facility. Well prior to spring of ’05, we’ve had tentative MOVE! Level 1, it’s kind of like a weight management 101 type class. We just turned our old weight management class into the MOVE! Level 1 class. …unfortunately, well back then it was more like we had nothing else to offer and so they’d attend the class and when you could tell they were, you know, newly motivated or wanted additional information, at that point, we had nothing more to offer. Dietitian Supervisor: The biggest strength of MOVE! is its inter-disciplinary emphasis. …the biggest thing is the inter-disciplinary strength because the dieticians can not affect the need to change by themselves and even though we’ve been teaching weight control for years and years, the enhanced education for the patients by having those other people up there to support the mental health aspects of this and the exercise aspect as well as our end of it, to me is really the number one. The case memos were imported into NVivo Version 8 and then coded so that reports could be generated that contained all summary statements and supporting quotes for all the cases. The code reports provided rich detail to help understand how each construct manifested in the low and high implementation facilities. Findings were developed and used to craft recommendations based on practices at the high implementation facilities that appeared to contribute to positive ratings, while suggesting ways to mitigate or work-around constructs with negative influence (i.e., barriers) at the low implementation facilities. Data from the transition facility were used to further confirm or contrast these findings qualitatively. Of the 31 CFIR constructs assessed, 10 constructs strongly distinguished between facilities with low versus high MOVE! implementation effectiveness (See Table 3). Another two constructs exhibited a weak pattern in distinguishing low versus high implementation effectiveness. Sixteen constructs were mixed across facilities. The remaining two constructs had insufficient data to assess. The following sections briefly describe each construct, highlighting how they manifested in the study facilities. We also provide brief suggestions, insights, and reflections for coding constructs. Additional file 2 provides more detailed descriptions of the manifestation of those constructs strongly differentiated between low and high implementation facilities. Our online wiki provides more comprehensive coding and rating guidelines (http://wiki.cfirwiki.net/index.php?title=CFIR_Taxonomy). ** Construct strongly distinguishes between low and high implementation effectiveness. * Construct weakly distinguishes between low and high implementation effectiveness. a I: Treated MOVE! as internally developed E: Treated MOVE! as externally developed. This was not a distinguishing construct because it did not vary across sites; most of the study facilities regarded MOVE! as an externally developed program. The one exception was a high implementation facility that embraced MOVE! as a welcome extension to their already-existing weight management program. Note that although the program was actually developed externally, it is important to code based on local stakeholders’ perceptions of the program’s source. Thus, the site that viewed MOVE! as an extension of their existing program perceived the source as more internal than external. We coded this construct neutrally as ‘internal’ or ‘external’ rather than assigning a positive or negative numeric rating, because we were interested in whether the perceived source varied across sites, not in whether that source was viewed positively or negatively. This was not a distinguishing construct. Though one of the low implementation facilities had a particularly strong negative view of the evidence supporting MOVE! (‘we had a difficult time selling chief of staff and chief of medicine on the efficacy of the pilot study’) and one of the high implementation facilities had a strongly positive perception of the same evidence, the other three facilities had a weakly positive perception of the evidence that was vaguely expressed. Some interviewees cited evidence from the literature, some inferred MOVE! should be successful because they thought other weight loss programs were (e.g., Weight Watchers), and some believed camaraderie arising from group visits would be helpful for their Veterans. It is important to note that evidence may come from multiple sources, not just published scientific literature. This was not a distinguishing construct because it manifested as a strong positive influence in four of the five facilities. We heard about many examples of how MOVE! was adapted to their facility; e.g., variation in the number of sessions, duration of the classes, exercise approaches, patient screening process, class content, and whether groups were ‘closed’ (no new patients were allowed to join until the start of a new series of classes) or ‘open’ (patients could join anytime), and where the program was administered—e.g., within primary care or nutrition and food services. This was not a distinguishing construct. Most sites did not conduct a trial; but because our interviews took place well after implementation had started, it was difficult for interviewees to recall whether this was because the program didn’t allow it (-1 rating) or that it was allowed, but the site decided it wasn’t necessary (0 rating). Only one site actually did a trial (+1 rating) and a second study site mentioned learning from the experience of another site in their region who participated in the national pilot study of MOVE! (+1 rating). This was not a distinguishing construct because all sites viewed the implementation of MOVE! as a complex process. MOVE! requires staff participation from multiple service lines/professions (e.g., dietitians, health psychologists) to set up substantial, new infrastructure to support group visits, new processes to screen and refer patients, etc. The single facility that regarded MOVE! as relatively simple had the most well-developed pre-existing weight management program. It is important to note that we ‘reverse rated’ this construct to be consistent with the other constructs; i.e., a positive sign denotes a perception of a less complex implementation and a negative sign indicates a more complex implementation. This was not a distinguishing construct because four of the five facilities were consistent in finding materials and support from the national coordinating office to be helpful. We included perceptions of supporting materials and guides within this construct. Other programs will be ‘packaged’ differently; so, operationalization of this construct will vary widely, depending on the type of program or intervention. This was not a distinguishing construct because cost was not an explicit consideration. The more salient construct was available resources (see below), because of constraints in available staff time and classroom space. One patient was so enthused about the program that he recruited other Veterans to come to MOVE! and had a list of ‘between 50 and 100 patients’ who agreed to try MOVE!. Staff at both of the low implementation facilities mentioned that a barrier for patients was the co-pay (an out-of-pocket payment for the service) required to attend MOVE! classes (this co-pay has since been waived). Staff at one low implementation facility thought that patients would be concerned about losing VA healthcare benefits if they got healthier by losing weight. This facility was rated as 0 (neutral) overall. Some neutral ratings reflect consistently neutral influences, but for this case we assigned a neutral rating because of mixed positive and negative influences, which balanced each other. To code and rate this construct, we looked for evidence of staff not just demonstrating knowledge of their patients’ needs and resources but also the degree to which this knowledge was acted upon to better align the MOVE! program with existing processes. This was not a distinguishing construct. Most people we talked to had few or no contacts outside their facility. The exception to this was the transition site where the MOVE! coordinator was recently hired from another facility and retained professional ties with several other coordinators. She was able to draw on this network to learn about and apply strategies that worked elsewhere (rating of +1). Peer pressure was neutral at all of the facilities because none of the interviewees had anything to offer on this topic. These study sites, being publicly supported medical centers, were not subject to competitive or market pressures. At this early stage of MOVE! implementation, there was also an absence of urgency or pressure to implement to keep up with other VA sites. Though interviewees were not asked directly about peer pressure, open-ended questions gave ample opportunity for influences of peer pressure to be expressed, and it was clear that these influences were absent (i.e., neutral influence). This should be contrasted with a code of ‘missing’ in the event that we do not have any data to determine the nature of the influence. This construct comprises many of the traditional quantitative measures of context, including age and size of the organization. There was no mention of these aspects influencing implementation of MOVE!, perhaps because these measures are often proxies of more proximal factors. This construct also includes potential influences of the social architecture (e.g., how people are organized into separate service lines or clinics to deliver health care). We found that the quality and nature of networks and communications within and across organizational units were the more proximal influence, as described in the next section. In contrast, at one low implementation facility, a former MOVE! coordinator was not even told that a new coordinator had been hired to replace her. Thus, the two high implementation sites were rated a strong positive, and the two low implementation sites were rated a strong negative. We did not ask explicitly about perceptions of overarching culture. This construct comprises six sub-constructs. Conceptually, the aggregate of these six constructs may provide an overall measure of implementation climate, but we rated the individual sub-constructs, which are more useful for generating actionable recommendations. Compatibility has two major themes: compatibility with stakeholder values and compatibility with existing processes. Related to the first sub-theme, one low implementation facility felt that programming for a community-based program was better aligned with their desire to provide a wider array of options that focused on wellness, versus MOVE!, which at that time was marketed to “obese Veterans.” Related to the second theme, MOVE! was perceived as being highly compatible in one of the high implementation sites with a pre-existing metabolic clinic which focused on weight management. This construct strongly distinguished between high and low implementation facilities. At one high implementation facility, the high priority of getting a bariatric surgery program in place worked against MOVE! implementation efforts at first. However, the MOVE! coordinator successfully linked the success of the bariatric surgery program to success of MOVE!, which increased priority for MOVE! This was not a distinguishing construct. There was little or no evidence of any monetary rewards or of less tangible incentives like positive evaluations at any of the study facilities. The absence of incentive was rated as a weak negative influence at one low implementation facility because an interviewee acknowledged that she could not expect to get a raise, a bonus, or a pat on the back for successfully implementing MOVE!. All other sites were rated as neutral. In addition, coordinators in both of the regions associated with the high implementation facilities used program data to keep the program visible with key regional-level leaders. One regional coordinator used program data to win funding for additional dedicated staff at all of the medical centers in the region, and the other regional coordinator coached local coordinators about how to use program data to argue for needed resources. This construct comprises three sub-constructs. Conceptually, the aggregate of the three constructs may provide an overall measure of readiness for implementation; but like our approach for implementation climate, we rated the individual sub-constructs instead, which are more useful for generating actionable recommendations. This construct strongly distinguished between high and low implementation facilities. Service chiefs at the high implementation facilities allocated time for their respective staff to be a part of the interdisciplinary team and the coordinators had supervisors who were actively supporting the program. Leadership engagement was often double-coded along with relative priority and available resources. It is sometimes difficult to disentangle these influences. Engagement of leaders is often demonstrated by their actions in reinforcing priority and helping get needed resources in place, as the above illustrations show. However, staff at the high implementation and transition facilities viewed these constraints as challenges that could be overcome, rather than feeling defeated by them. In fact, one high implementation facility, despite tight budgets, won approval for dedicated staff time and was in the process of hiring an additional staff position that was approved by regional leaders. This was not a distinguishing construct. NCP published program materials online, including an implementation guide. We coded this construct as ‘missing’ at two facilities because there was no explicit mention of the helpfulness of these materials as an information source and we failed to probe more on this topic. This construct should be distinguished from design quality and packaging, in that it focuses more on access to information about the intervention and how to incorporate it into work tasks; where design quality and packaging focuses more on how components of the intervention itself (such as patient materials) are packaged and presented. This was not a distinguishing construct. All but one of the study facilities had enthusiastic, skillful, and capable program coordinators committed to getting MOVE! up and running. All facilities were required to name a physician champion; however, these ‘champions’ were largely absent in three of the facilities. The exceptions were physicians at one high and one low implementation facility, who both worked actively to help implement MOVE! The CFIR explicitly lists several roles within this construct. We did not find any evidence for the role of opinion leaders, and there were no external change agents. It is important to identify other key types of stakeholders prior to conducting interviews, if possible, so that respondents can be asked explicitly about their degree of participation. For example, our study would have benefited by interviewing primary care providers because they are the source of patient referrals to MOVE! but we chose to focus on people more closely involved with implementing MOVE!. As mentioned above, none of our study sites had formal implementation plans, so it was impossible to assess the quality of execution relative to a plan. For example, well-defined incremental milestones were not established, and thus we were unable to assess the extent to which those milestones were met. Thus, we indicate that this construct was non-applicable for all facilities. This construct is best assessed during the course of implementation, and without formal planning, is difficult to define or measure. It is important to clearly define what constitutes quality execution a priori. We evaluated implementation of a weight management program that was disseminated to all VA facilities in 2007. Using a systematic approach based on a qualitative, consensus-based rating process, guided by the CFIR, we found that twelve constructs manifested more positively (ten strongly differentiated, two weakly differentiated) in the high implementation compared to low implementation facilities. Additional file 3 provides recommended actions to improve the influence of each of the differentiating constructs based on our findings. Only one construct related to program attributes seemed to be an important antecedent to set the stage for successful implementation—staff perceptions of the relative advantage of MOVE! over other alternatives (e.g., status quo, community program). Perceptions about the advantage of MOVE! appeared to be amplified when there was a perception of need for the program (tension for change, a construct from the Inner Setting). The majority of constructs that distinguished between high and low implementation facilities were related to the inner setting. Klein et al. and others [15, 28] highlight the important and influential roles and interrelationships of leadership engagement, available resources, and relative priority. Leadership engagement can lead to provision of sufficient available resources in terms of space and dedicated time, and strong communication about the program, which in turn can lead to sufficiently strong perceptions that an intervention has high relative priority in the midst of other initiatives. All three of these constructs had a markedly stronger presence in the high implementation facilities. In addition, MOVE! is a complex program  requiring organizational change to deliver a new treatment modality. One indication of the complexity of the program is the need for coordinating efforts of staff across multiple departments . Indeed, we found that high implementation facilities had more high-functioning team, cross-boundary working relationships, and communications about MOVE! (networks and communication). Our findings also affirm the importance of collecting and using available program data as a mechanism (goals and feedback) to engage key organizational leaders and to win approval for staff dedicated time to the program, as well as a process of on-going critique and evaluation (reflecting and evaluating) of the program. It is important to note unique overarching contextual factors related to implementing MOVE! in VA facilities that may have contributed to the seemingly lack of importance of some constructs. First, there was little variation in the perception of MOVE! itself: four of the five facilities had a positive view of evidence strength and quality, perhaps because NCP, the central coordinating office, assembled and presented results of a pilot study via multiple venues. Adaptability was strongly positive in all but one facility because of the latitude they felt they had to adapt the program to fit their organization, most staff did not think to trial the program before going full-scale, and unless there was a robust pre-existing weight management program already in place, MOVE! was perceived to be a complex program to implement. Second, all facilities had access to program materials, including an implementation guide, power point slides and lesson plans (design quality and packaging) that were developed by an external entity (the National NCP office), which four of the five study sites regarded positively and relied upon to help develop their program. This was likely a significant facilitating factor . Third, a relatively consistent factor that was surely key to any level of success was the enthusiastic, skillful, and capable program coordinators committed to getting MOVE! up and running; all but one facility had such leaders. Fourth, some constructs had a neutral effect across all facilities (e.g., peer pressure, cost) though these constructs may have significant effects in other contexts. For example, none of our study facilities experienced any peer pressure (e.g., competitive market forces) because they are publically funded hospitals. These constructs should continue to be considered in future studies to ascertain their importance in other contexts. As we continue to use the CFIR in other implementations studies, we plan to build a repository of findings where we can begin to examine the relationships among intervention characteristics, inner and outer settings, and implementation processes to better understand the circumstances under which some constructs have a significant role in affecting implementation, where others do not. Findings from such analyses can then be used for predictive purposes, to help organizations focus on particular constructs over which they have control, given the status of other constructs that are not mutable. To illustrate how to apply the CFIR to identify influential contextual constructs on implementation and to suggest refinements to the framework, related methods, and directions for future research. Two of the six team members (LJD and JCL) were familiar with the CFIR, but this study was the first application of the CFIR for guiding data collection, coding, and analysis in a qualitative study. Because we used a consensus-based approach, we did not quantify the number of discrepancies between analysts; but we can report that we had no trouble reaching consensus on final codes and ratings. We did identify a few constructs that were closely related (e.g., relative priority versus patient needs and resources, design quality and packaging vs. access to knowledge and information) and, thus, were more challenging to code; but as a result of our discussions and consensus, we now have specific examples to clarify the distinction among these, which we have added to our Wiki (see below). Our analysts found the CFIR definitions to be sufficiently comprehensive for coding all interview responses. While we did not do a parallel process of inductive coding to compare with our more deductive, framework-based approach using the CFIR, we were open to new themes and the group was comfortable that we did not miss any significant themes outside those captured by the CFIR constructs. Though ratings were initially assigned within the context of each case, they were also compared across cases. The last step in our analyses used a predominantly variable-oriented approach as the means by which to identify constructs that differentiated between high and low implementation facilities. In essence, constructs were treated like independent variables. A statistical analogy is that these ‘variables’ would have statistical significance in a model predicting implementation effectiveness—i.e., the positive manifestation of any of these factors in a facility improves the likelihood of implementation success. This approach heightens generalizability based on a small sample of cases. However, we are unable to explore interactions between constructs or identify multiple combinations of constructs that may work together for success or failure. Kahwati and colleagues’ evaluation of MOVE! used a qualitative comparative analysis approach which identified combinations of constructs that lead to success or failure. This approach embraces the premise that there are multiple ‘right ways’ that can result in success. A look at the two high and two low implementation facilities in Table 3 shows that each has a different combination of constructs that strongly manifest negatively or positively. We did not have sufficient sample size to generalize from these working combinations. In our 2009 paper that introduced the CFIR, we posed three questions by which to judge its usefulness as a theoretical framework . The first question is whether terminology and language are coherent. As part of this study we have clarified the operationalization of a number of constructs; and we provide more coding guidance on our online wiki (http://www.wiki.cfirwiki.net). Our analysts, inexperienced in applying the CFIR, were able to successfully use the framework for coding. Second, is whether or not the CFIR promotes comparison of results across studies. Use of a standard set of constructs sets the stage for doing so, but more studies are needed to test this supposition. Last is whether the CFIR stimulates new theoretical development. The CFIR can be regarded as a ‘menu of constructs’ that have the potential to influence implementation . In the case of MOVE! implementation at VA facilities, a working theoretical model to guide future implementation would include the twelve constructs that differentiate between high and low implementation effectiveness. Continued research is needed to develop measures, propose and test models that predict implementation based on these theoretical constructs, and assess the extent to which these constructs can be used to develop implementation strategies to maximize a facility’s chances for success. Some of our recommendations were taken by NCP, the central office administering MOVE!, to bolster implementation in more facilities, but a systematic evaluation of their effect on implementation success has not been conducted. It would also be informative to assess whether or not these same twelve theoretical constructs are predictive in contexts outside the VA or for other clinical interventions. Our study is limited by several considerations. First, qualitative data was retrospective and elicited from only people directly involved in implementing MOVE!. Other peripherally involved stakeholders (for example, primary care providers who refer patients to the program) were not included. Second, we did not interview patients about their experience but rather relied on impressions from staff. Third, we did not use the CFIR in its complete form; we did not systematically evaluate the individual characteristics domain. We took a decidedly organizational or collective perspective in this evaluation. Thus, our findings do not shed light on how individual characteristics or behaviors may interact with collective actions or perceptions captured by the other four domains of the CFIR. Fourth, though we strongly recommend that analysts be blinded to implementation effectiveness for study during the course of coding and applying ratings to constructs, our analysts were not consistently blinded. Thus, there is the possibility of bias in the ratings. Lastly, our sample size was small (n = 5) and thus generalizability may be limited. However, our small sample size allowed an in-depth analysis and understanding of the implementation experience in five widely varying contexts. Our menu-of-constructs approach, using the CFIR, will promote integration of our findings with findings from other studies using the CFIR. This paper presents our approach for using the CFIR to code and rate qualitative data, which can then be used to facilitate comparisons across studies. We are continuing to use the CFIR in this way in our research center’s implementation studies, further refining construct definitions and, in turn, refining and increasing the reliability of the coding and rating process. An online Wiki resource (http://www.wiki.cfirwiki.net) is available that contains much of the published information about the CFIR and its constructs and sub-constructs. The CFIR Wiki is designed to promote sharing, to elicit suggestions for refinement, and to continue to develop approaches using the CFIR—all of which helps set the stage for synthesis of findings across studies. Guidelines for coding qualitative data are posted along with example interview guides from this and other studies using the CFIR. Registered users can comment on any aspect of the CFIR; e.g., suggesting refinements or changes in construct definitions. We hope that the approach described here and open access to the CFIR will generate on-going dialogue and continued refinement of both the framework and approaches for applying it. We gratefully acknowledge funding for this work from the VA Quality Enhancement Research Initiative (QUERI). We want to also thank our many colleagues engaged in implementation research in VA who have been tremendously supportive of this work and thank you to the reviewers whose thoughtful comments greatly improved the quality of this paper. LJD and JCL conceived of the paper. LJD drafted the initial manuscript and JCL also wrote significant portions. Both authors read and approved the final manuscript.